Here’s all the inside scoop from the fairytale wedding of Bollywood’s favorite couple! After months of speculations, Bollywood’s most loved couple, Ranveer Singh and Deepika Padukone tied the knot in the picturesque location of Lake Como. 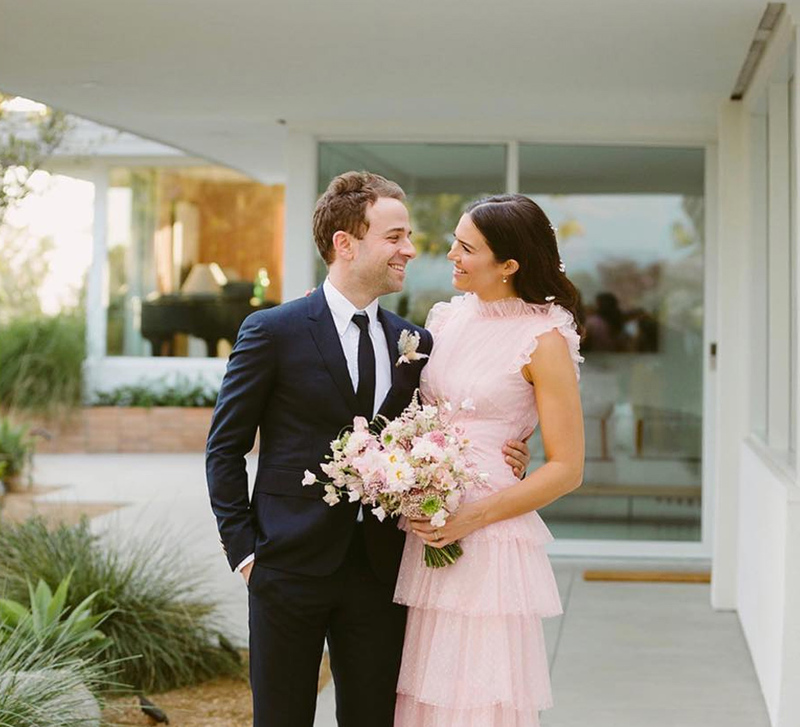 Their love story is no less than a modern fairytale but their extraordinary celebrations on the beautiful property will make you feel warm and fuzzy. Villa del Balbianello - the magnificent property in Italy is where the couple hosted the wedding with its stunning interiors. Surrounded by lush green mountains and a serene lake, it is straight out of a fairytale — just like this celebration! A few days back, the bride-to-be was in her home-town with close friends and family for a Nandi Pooja. The ceremony is performed to ensure the wedding goes off without any conflict, and to bless the couple with good health and prosperity. For the pooja, Deepika chose a saffron kurta and dupatta, paired with cream pants and statement jhumkas, all by Sabyasachi Mukherjee. The pre-wedding ceremonies including Mehndi and Sangeet took place at the ultra-luxurious CastaDiva Resort and Villa d'e Este in Italy. At the Mehndi ceremony, the handsome groom was seen in a printed cotton angrakha and an embroidered silk bundi while Deepika adorned a pink threadwork kurta. She teamed up her powder onion pink threadwork kurta with a threadwork dupatta of the similar colour and the actress added another layer by wearing a red shawl over the dupatta. The groom's event took place at the CastaDiva Resort overlooking Lake Como and Deepika's ceremony took place at the glamorous Villa d'e Este. While Deepika got some designer Mehndi done, Ranveer too got a little Mehndi design on his hand with #DeepVeer written. The ambience at the event was lively and the couple along with their family members danced their heart out. The guests were personally greeted at the venue with a hand-written note. The couple got engaged in a Konkani traditional Phool Muddi ceremony which usually takes place a day before the wedding in which the bride and the groom’s family meet each other and perform puja and offer prayers. Taking our Insta feeds by storm, the awe-inspiring couple shared candid pictures from their nuptials; captioned with a simple red heart, they struck a chord in the hearts of many! An image from their Konkani wedding unfolds a funny moment shared between the two (of course, humour follows our lover boy!). As for their attire, Deepika made for an epitome of understated elegance in her golden silk saree while Ranveer looked suave in his classic cream sherwani. For the Konkani wedding ceremony, Deepika was seen in a golden wedding saree gifted to her by her mother (as per tradition) and was given to Sabyasachi by Deepika's mother. It was also revealed that the saree was bought from Angadi Galleria in Bengaluru. As per tradition, the bride wears a sari given by the mother and the red gold sari is a real zari Kanjeevaram. The body design is the Gandaberunda (two-headed bird) the mythological figure that is also represented as the coat of arms of the Mysore Maharaja and subsequently Karnataka. The couple performing a Konkani ritual called Udida Muhurat where the bride and groom grind black gram and the significance is to teach the couple about the nitty gritties of married life. The couple played a few light-hearted games after the Konkani rituals were completed and it is believed that whoever won the game will have the upper hand in the marriage! The bride and groom shared a meal after the wedding to signify their bond of love and sharing! For the Sindhi Wedding, our Bollywood Jodi chose to coordinate in colours of red and gold. Deepika Padukone chose a beautiful red Sabyasachi Lehenga, complete with an embroidered veil that bore an incantation, of which ‘Sada Saubhagyavati Bhava’ was visible on the border in Devnagri. 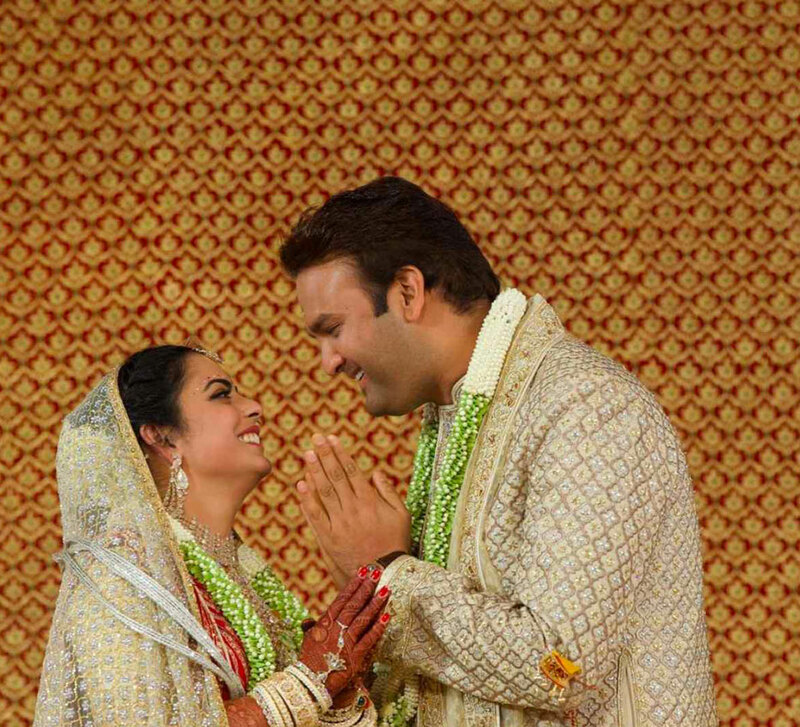 The groom complemented her in a Kanjeevaram sherwani, also by designer Sabyasachi Mukherjee. 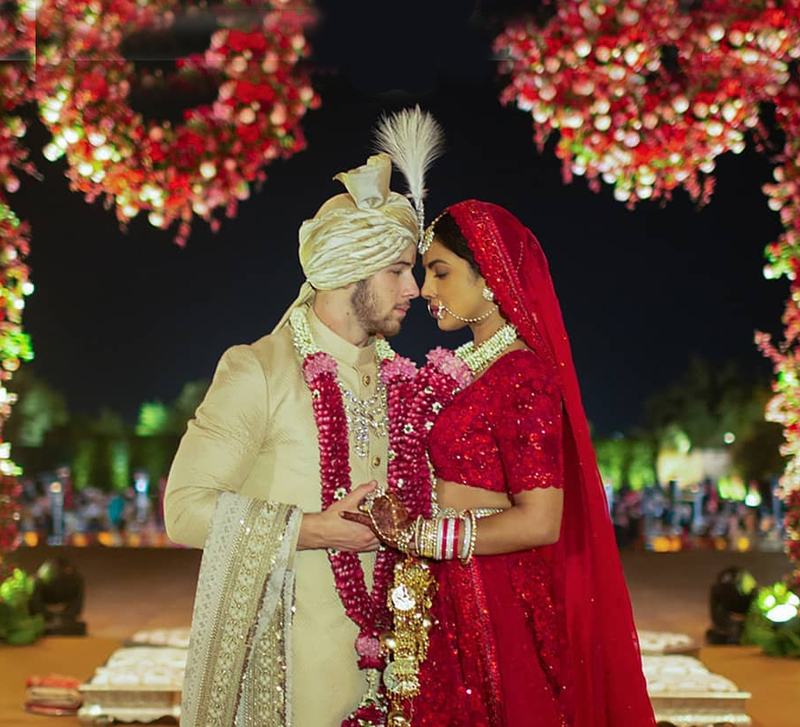 The bride accessorised her lehenga with a maang tikka, traditional kalire, a statement nose ring and several rings and Ranveer wore strings of large rubies, and a jadau necklace too. With intricate yet elaborate jewellery, their ensemble exuded a royal finesse. Sabyasachi, the designer, collaborated with Christian Louboutin and came up with bespoke juttis for their wedding day. Florists from Florence decorated the wedding venue with Deepika's favorite flowers water lilies and Chefs from India and Switzerland were flown in to join the catering team for desserts and the wedding cake. For the Bangalore reception hosted by the bride’s parents at Leela Palace, the newlyweds dressed in royal attire for the big night. Ranveer and Deepika shared the first picture from the reception on their social media. While Ranveer picked a black-golden sherwani by Rohit Bal, Deepika was seen in a shiny golden silk saree which was a gift from her mother, Ujjala Padukone. The saree was styled by Sabyasachi and the bride accessorized her ensemble with a statement emerald studded choker, a mandala medallion and large studs, and layered it with an elegant pearl raanihaar. The newly-weds spent their evening celebrating their milestone moment with friends and family. The Bollywood power couple kept the party going with their post-wedding party organized by Ranveer Singh’s sister in Mumbai. The groom looked his usual self in a colourful Manish Arora Outfit making a statement with a neon applique jacket by worn over a black kurta and pants with heart motifs. Deepika, on the other hand, looked like a bohemian goddess in her floral lehenga designed by the ace designer, Sabyasachi. Looking resplendent in Sabyasachi’s Dil-guldasta’ lehenga intricately embroidered on Bordeaux silk with hand-dyed velvet appliques, silk-floss, beaten silver and gold thread and rose-tinted crystals and rhinestones, she channelled Frida Kahlo at this extravagant party. Deepika accessorized with a floral headband and braided updo and jewellery from the Sabyasachi Heritage Jewellery Collection and completed the look with a sheer embroidered dupatta. The couple’s outfit sure looked exciting, but they both decided to take things up a notch with Ranveer wearing some Kajal and Deepika rocking the goth-inspired eye makeup. The third in the series of post-wedding parties was held at Grand Hyatt, Mumbai and was attended by family members and friends along with media. Deepika took a break from wearing Sabyasachi and donned a gorgeous Ivory and Gold Chikankari saree by designer duo Abu Jani and Sandeep Khosla with jewellery from Saboo at AJSK. Ranveer twinned with his beautiful wife in an ivory and gold embroidered sherwani with wide-legged trousers by designer Rohit Bal. The Padukone family coordinated their looks with the couple. Prakash Padukone, Ujjala Padukone, and sister Anisha were seen in beautiful white outfits designed by Abu Jani - Sandeep Khosla. 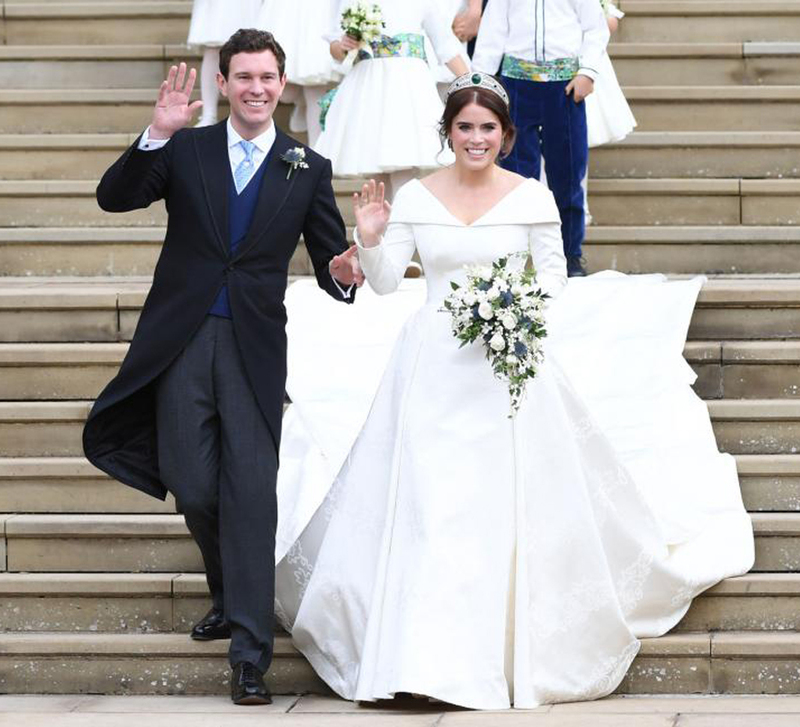 We wish the couple a future full of happiness and togetherness! Saving the best for the last, this power couple looked every part the king and queen for their reception at The Grand Hyatt Mumbai. The stunning couple upped the glam quotient in their red and black outfits with Deepika in a bold red custom-made Zuhair Murad gown and Ranveer looking dapper in a black tuxedo, courtesy of Rohit Gandhi and Rahul Khanna. For their portraits before the party, Deepika wore a matching red veil which she later let go off and traded the mile-high heels for comfy white sneakers later that night. Ranveer too swapped his tux jacket for a leopard print one to simply enjoy and dance the night away.